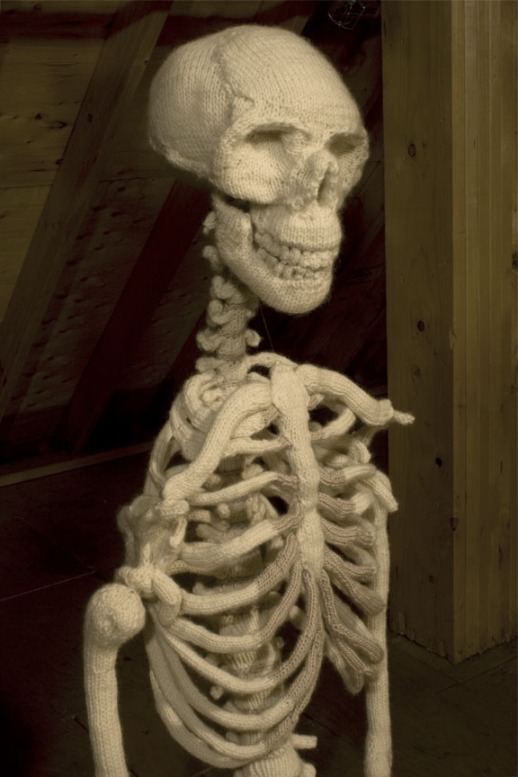 This extraordinary knitted skeleton is the work of the author of this incredible blog. Go check out the detailed photos of the hands and vertebrae. They are A.Maz.Ing. I thought I was very clever making a scarf out of all my leftover sock yarn. 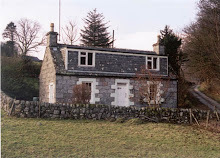 Until the day dear old Dad had an issue with a sock I had knit him last year. 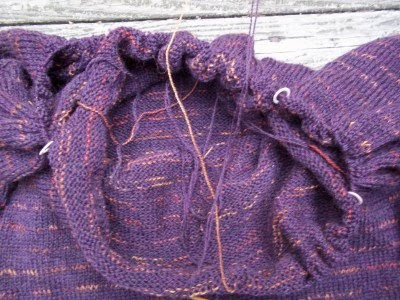 He had torn a gaping hole from the ribbing to almost halfway down the leg that was 4 stitches wide. If you look closely in the very center of my scarf you will find the yarn I need to make a decent repair. Needless to say, he is not getting a decent repair, he is getting some Frankenstein stitches. It'll have to do. Besides, I know he is going to just tear them up again. 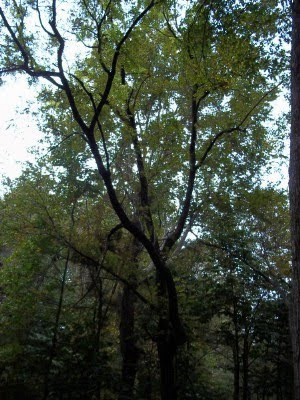 Hiding in the corner, by the creek, is an ancient black walnut. 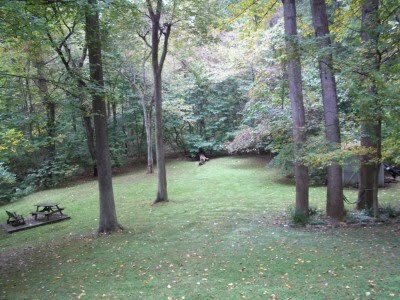 This tree and I have had issues as it drops large green nuts all over the area I need to mow. I usually take a golf club out and hit the nuts into the creek. I've gotten pretty good at it. 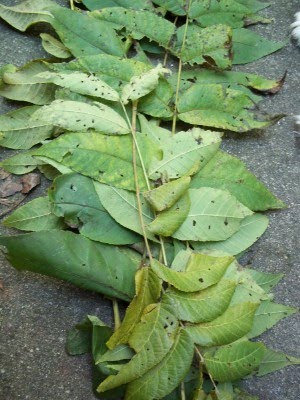 It also drops large branches of leaves which take a lot of raking. This tree is very high maintenance. My attitude about my tree changed dramatically when the last issue of Spin Off showed up. 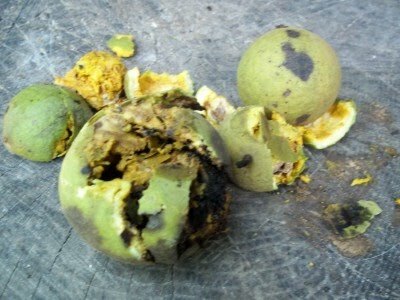 There was an article about using the nuts and the leaves to make a natural, but powerful dye. 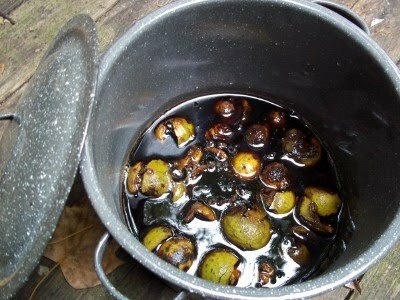 I smashed up the small handful of nuts I could find, as the season is pretty much over, and soaked them in water. Overnight the water turned dark brown. 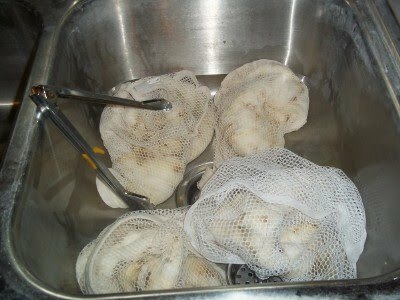 I need to soak them a week or so and then boil them before I can use them to dye. I can't wait. My Classic Lines Cardigan has sleeves! 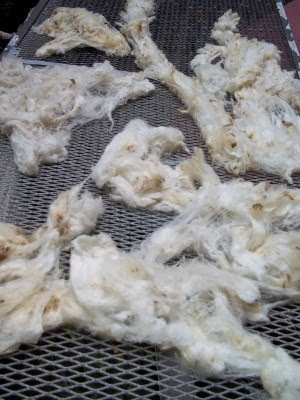 They are knit first and then joined to the body at the underarm. It is great to finally have things attached where they belong but that certainly leaves you with a lot of stitches on the needles. Hundreds and hundreds. You have to decrease here and there for the neck shaping but it seems like the neck is still very far away. I really want to wear this before it gets too cold but I also still have the steeking and the front bands to pick up and knit. I guess I am a lot farther away from wearing it than I thought. There's always spring. 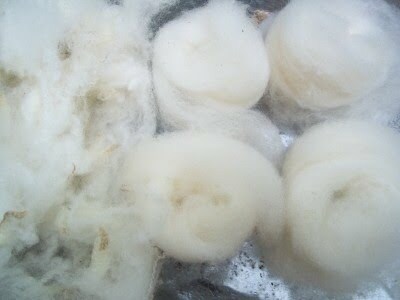 I have been combing my washed wool and making little nests out of it to put away for winter spinning. 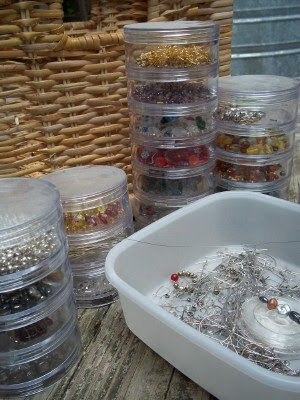 I have had to be creative in storing it away this year as I will have our new little kitty friends to deal with. They have recently taken an unhealthy interest in my wool. Every morning I wake to kitty shenanigans that usually involve interesting ways of turning handspun into giant tangles. They have not discovered my wheels yet, but I know it is just a matter of time. It's easy to see what I've been up to. My Crepidula needed more yarn dyed to match the Fresh Figs colorway I mixed up a few weeks ago so I had to make another mess in the kitchen. 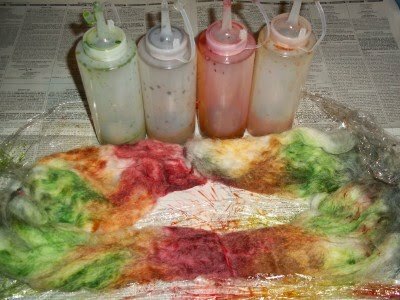 Luckily, I still had some of the dye left. 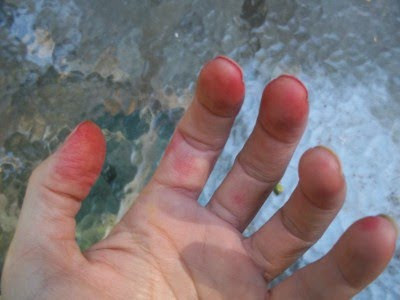 What I didn't count on was the dye intensifying. I suppose some of the water evaporated leaving behind a stronger concentration. The reds and golds got much brighter than in the original. I also did not have quite enough to saturate all of the fiber so some white is peeking through. 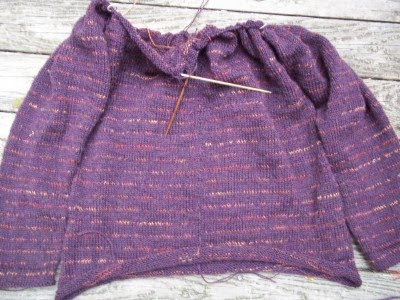 It is not going to be a perfect match to the top half of the vest but I still hope it will work-somehow. Before I went into serious sock production, I had put a lot of mileage on the Crepidula. 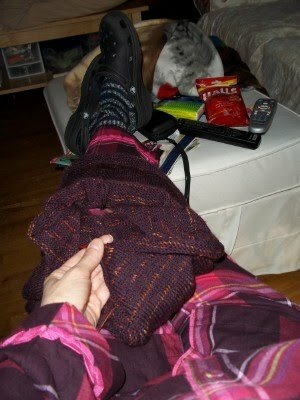 It's great mindless couch knitting. I have passed the sleeves and am working down the sides, so I could try it on for size. 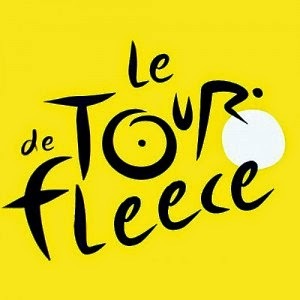 I can already see it's going to be a bit too small across the front. It won't close but since it is just a vest, I am not sure I really want it too. It's pretty crazy looking right now. I am hoping some blocking will straighten it out a bit. 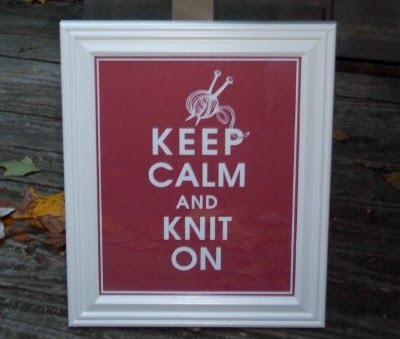 I am also running out of yarn. That's going to be a BIG problem. Daughter bought me this print from The Keep Calm Shop over on Etsy before my surgery knowing what a giant ninny I was and that I could use all the moral support I could get. The sentiment is very appropriate for my post surgery state of mind which seems to be hovering between panic and depression. Almost 3 weeks have past but I am still very frustrated and disgusted with my ever growing older body. I have learned that there are no quick fixes for stress related illnesses but from here on, instead of running to the doctor with every new ache and pain, I'm going to follow the advice in the frame-fewer side effects. I gave my new Merino a cold soak in the sink and then a scour with hot water and suds. I spun it nearly dry in the salad spinner and laid it out for the very few minutes of sun I now get each day on the deck. 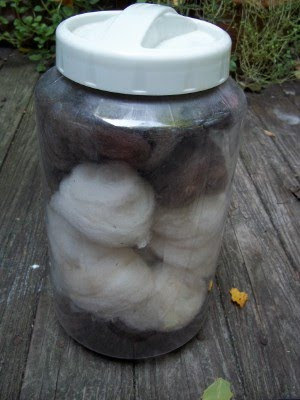 It looks pretty awful but I know from experience that when wool dries it turns into pretty fluff as if by magic. This may be the last time I get to work that magic this year as things are not drying well anymore. 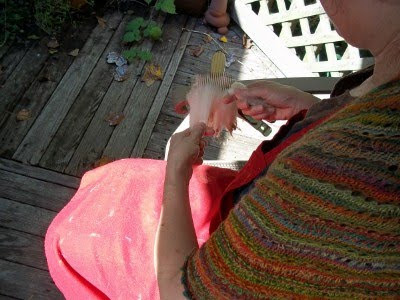 It's time to stop washing and start carding and combing before it gets too cold to sit outside. 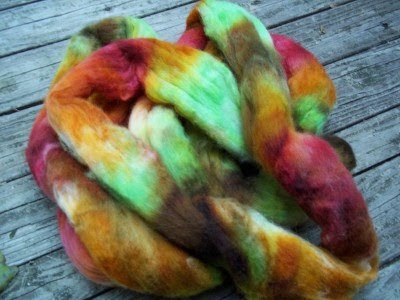 I bought 4 more ounces of raw Merino a few weeks before my surgery hoping to get it washed and combed before the days grew too dark and cold. It just arrived this week. It has really lovely crimp and is so soft and fine that I am a little perplexed on how to wash it. I can't identify individual locks as it is all in a jumble which means I am going to have to bag it up in several small lumps. 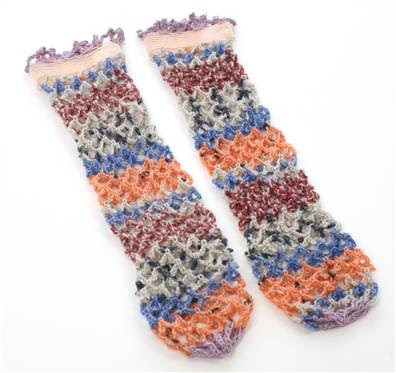 These Rodarte socks sell for $500. Seriously. And I thought paying $20 for sock yarn was crazy. If you are tempted to buy these, message me first. I'll make you a pair for $450. In my future I see lots of purple socks. I said I was going for plain vanilla but I took a detour and went to a pattern that has a little more pizzazz. The temptation to show off my knitting skills was just too strong so I caved. 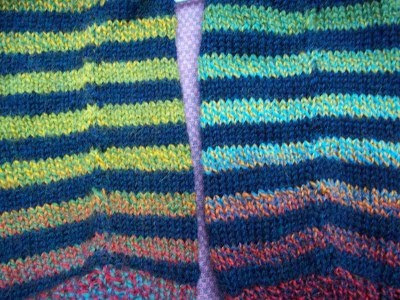 Son #1 requested warm socks for his lady friend so I'm probably still going to have to knit the plain vanillas in a nice sturdy yarn but now that I have broken my own speed record for plain janes, they can wait. I've been practicing my speed knitting so I can crank out two pairs of plain vanilla purple socks by request. Son # 1 wants some for a friend. Daughter wants a pair for her future Mother in Law. I have 70 balls of sock yarn (seriously) and only one was purple-purple but plain. 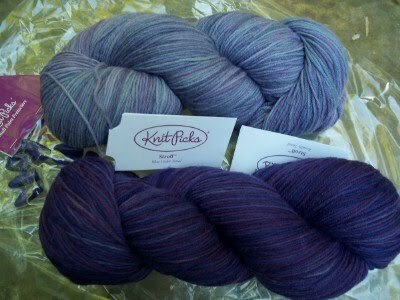 Knit Picks came to the rescue with two different purple colorways of their Stroll Tonal. I even picked up a couple of pairs of purple point protectors. 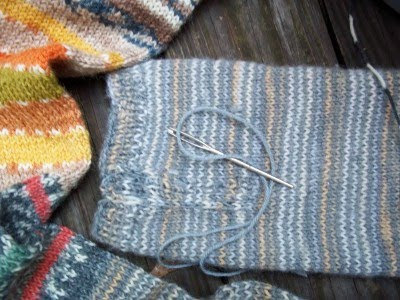 I don't have time for stupid mistakes and the stupidest is when I yank out the needle taking the socks out of the bag. I do it all the time. Ta dah.....two socks in less than 48 hours. I knit in the surgeon's office. 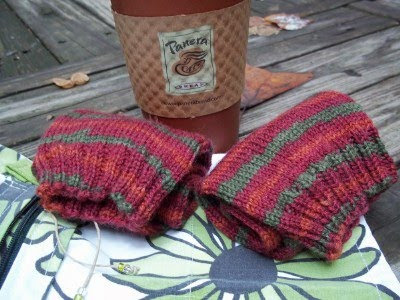 I knit in Panera where I had my first real cup of coffee in about 6 months. I knit everywhere. It was heaven to have my first taste of coffee again. I love strong black coffee but my former gallbladder did not. Of course I only had a few sips but it was the best coffee I have ever had in my life. I brought the cup home and sipped slowly and knit all day. As predicted, the second sock brought on a ton of problems trying to avoid pooling and puddling or at least to try to somewhat match the pooling and puddles that were on the first. I was moderately successful but there was a great deal of ripping back in spite of the needle sized up and down trick. 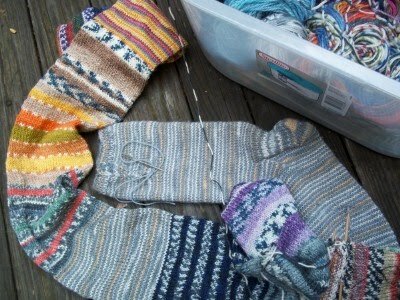 From now on when I make quick gift socks, I am sticking to yarn that is not quite so dramatic. 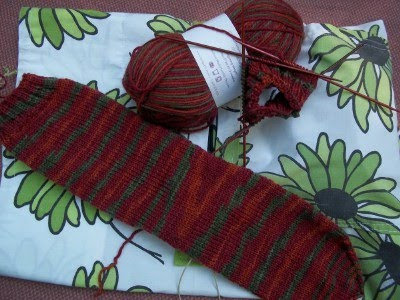 There is nothing worse than a new knitting bag without a new project in it. 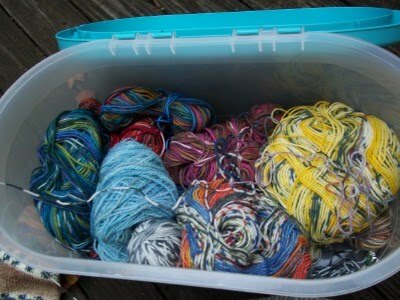 I have plenty of sock yarn in the stash so it was easy to find something to put in my cute little bag. Laying about waiting for stitches to heal leaves me plenty of time to do nothing so I challenged myself to see if I could finish a plain vanilla sock in just a single day. 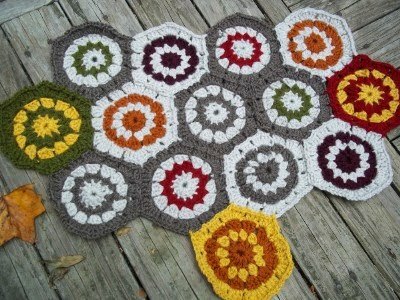 I have been crocheting very calmly on my hexagon afghan for months. I was using a very subdued palette-until one of my "hopped up" post surgery days. They tell you NOT to sign legal documents for several days after receiving anesthesia. They SHOULD also tell you NOT to make color choices either. I suppose those three wild hexagons will stay. I just will have to figure out where to go from here. When did I buy that yellow? One week after my surgery, I was determined to get on with life as usual. 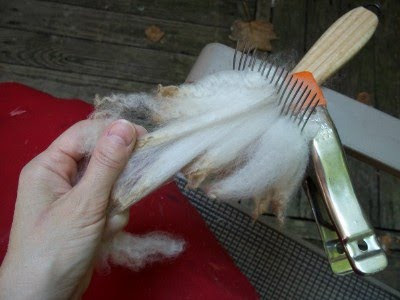 After dragging all my equipment outside, I discovered I did not have the range of motion to comfortably tackle combing wool. I also found that the latest washing had very dry, dirty tips. 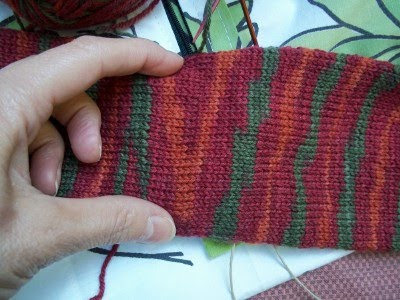 I could shock you with a peek at my belly, but the really interesting stitches are here on my striped socks. On the left is a sock I wore to the hospital, the one with the "bad" jogs. On the right is the sock I was working on in the hospital using Meg Swansen's jog avoiding technique of knitting into the stitch below of the first stitch of the color changing round. It's not perfect either, but it is an improvement over the "slip the first stitch" technique I had been using. On the 4th day of my recovery, I was able to focus my eyes enough to pick up the needles for some simple stockinette on my Classic Lines Cardigan. Anesthesia is nasty stuff. You wake up in the recovery room, but your brain doesn't really start to function like itself for several days after. I suppose it's a blessing because there is nothing good to remember about those first few days out of surgery, but it's eerie to have only vague memories of entire days at a time. I had a big surprise in the mail on Saturday. 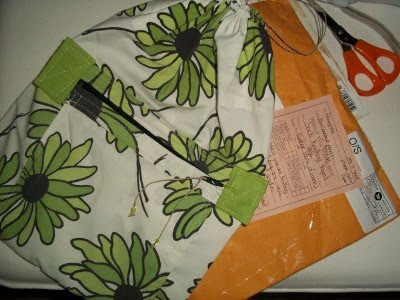 A Ravelry friend sent me another one of her amazing knitting bags made of vintage materials. This is a sock bag and it could not have arrived at a better time. In my convalescence, two family members have asked for gift socks. Nothing makes a knitter happier than knitting with a purpose and nothing makes me happier than having a great bag to keep it in! Mille fois merci Pinney, c'est très gentil! 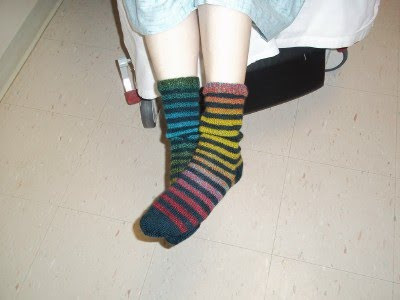 For weeks I had promised myself I would wear my newly finished Crazy Zauberball Socks to the hospital. It was the one and only thing I was looking forward too. I admit it, I am a GIANT ninny, a total scaredy cat. I had been dreading this day for so long it was like a long nightmare in painful slow motion. After being filled with anti-anxiety drugs, I was able to calm down enough to turn the heel on yet another Zauberball sock. I have enough left to hopefully get another pair out of the ball. Soon after The Mister took this photo, I was wheeled into a freezing cold torture chamber and everything went black. The nasty old gallbladder was hopefully dumped into the garbage. After that, I was in a state of drug induced amnesia for 3 days. Apparently I did a lot of things and said a lot of things that I don't remember but none of it had to do with knitting. 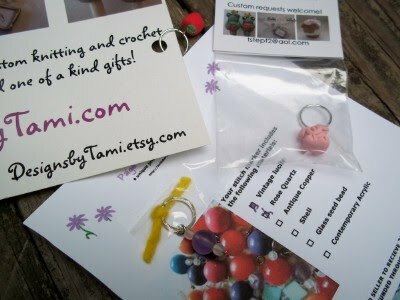 Here is the lace project and all the stitch markers I was complaining about yesterday. It should be smooth sailing because this is the fifth time I have made this cowl so I pretty much have the pattern memorized. If you are not a lace knitter and this gives you goose bumps, I assure you this is a VERY EASY lace pattern. You can memorize it AND read the stitch pattern as you go so you can watch TV or take it out in public without worrying about ruining it. Most lace does NOT fall into this category but the Flared Lace Smoke Ring does. It is so much easier and faster than it looks which means it makes an impressive gift. I have gifted this one many times. Now this one is for ME-and the best part? 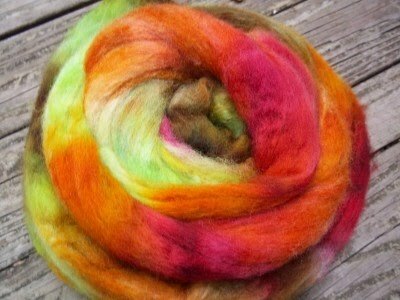 That is MY very own spindle spun Cormo. I have always hated the idea of dangly things hanging from my projects but lately I have found myself, on more than one occasion, overlooking an important marker. Then I have to tink back to make corrections after already loosing a great deal of time to head scratching while wondering what I had done wrong. 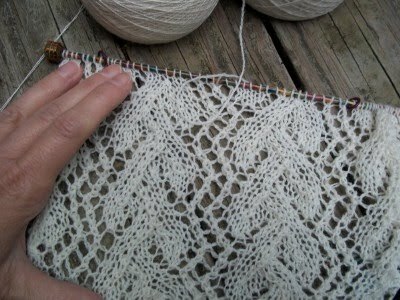 Usually what I have done wrong is miss the row changes in circular lace patterns. When you are working on a project that has tons of markers you need some that are unique so they make you stop and think. I have some cute ones that came in the Phat Fiber sample boxes I won last summer but I also have a basket of beading materials that need something to do. Now I just need to find the needle nose pliers and I'm in business. I have calmed down considerably since I nearly had a breakdown a few days ago over my inability to knit with gossamer weight yarn. 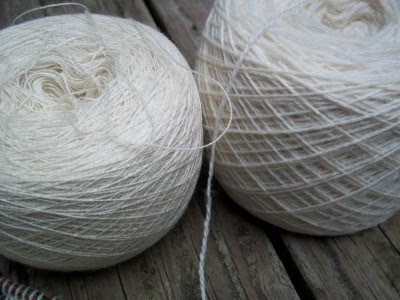 On the left is the offending material, on the right is the lace weight yarn that I knit with all the time. There is a pretty big difference in the two. 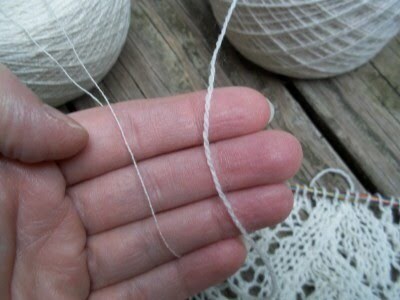 Try as I might, I could not wrap my fingers around this thread masquerading as yarn. Since admitting defeat, I have managed to make good progress on the pattern. One day it will be a Print O' the Wave stole designed by Eunny Jang and the pattern can be found free here. I have not given up on the $30 ball of lovely gossamer. I am just going to play with it for a while to see if I can teach my fingers how to deal with it. 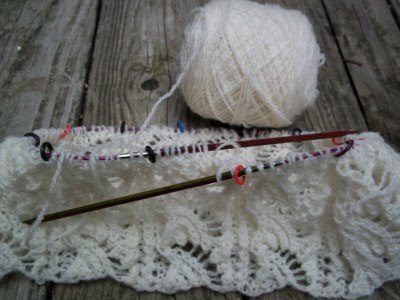 It will be a shawl someday, just not today. 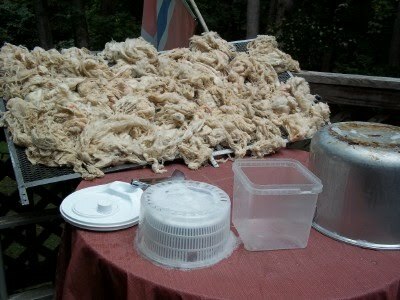 My freshly spun Wool of the Andes is going to become a vest. A Crepidula to be exact. I found the pattern here on Beyenburgerin's Weblog. 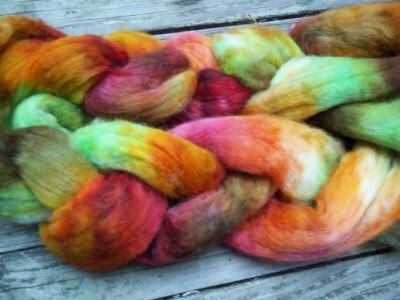 When you are working with handspun that looks like handspun it takes a while to find a pattern that suits it. 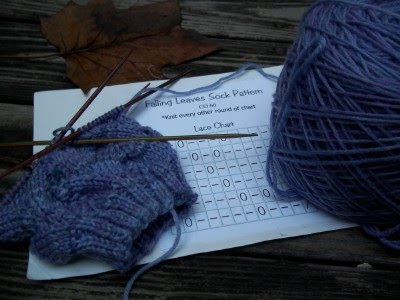 It requires a pattern that won't end up looking like just plain old bad knitting. 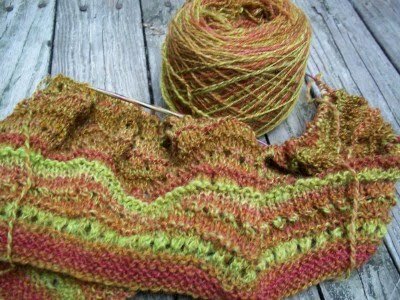 As happy as I am knitting along on this, I do realize that I will run out of my handspun, hand dyed yarn long before I run out of vest. This means trying once again to match something that is pretty much unmatchable. First let me say that I am NOT some miracle of nature. Those of you who know me, know that today I am in the hospital getting my gallbladder yanked out. The projects you will see this week were all posted in advance. The only thing I will be doing this week is laying on the couch watching everything in my Netflix Instant Queue. I may disappear later in the week as my posts run out, but as soon as I can I will be back with lots of big messes to share. 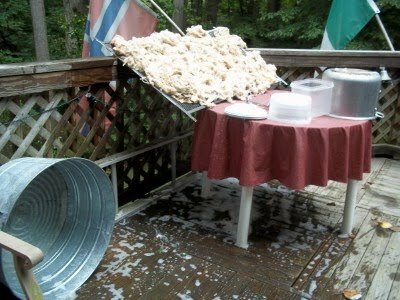 Last week, in anticipation of cooler weather and my recuperation time, I went ahead and made a GIANT mess on the deck washing all of the rejected unwashed wool I had stashed away for who knows what reason. 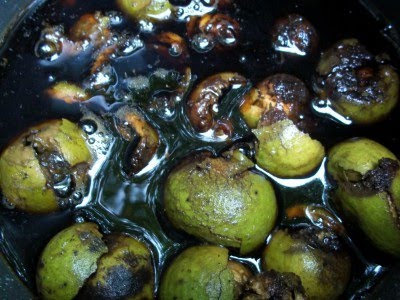 I didn't give it a real washing- just a dunk in boiled water to kill whatever may be living in it. I also wanted to keep as much of the grease in it as possible to add to its insulating properties. We have a small colony of feral kitties that have little winter huts to shelter in. Normally we fill them with straw but I had the idea of lining the inner boxes with nice, warm wool this year. What I didn't check was the weather report before I got started and didn't realize we were heading for a week long monsoon. 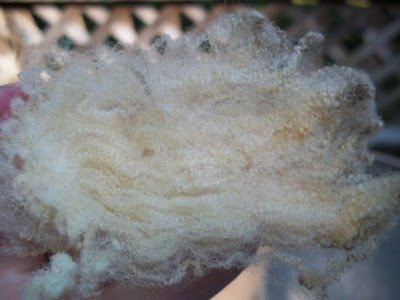 All that smelly wool is still in the house where it is doing its best to NOT dry. 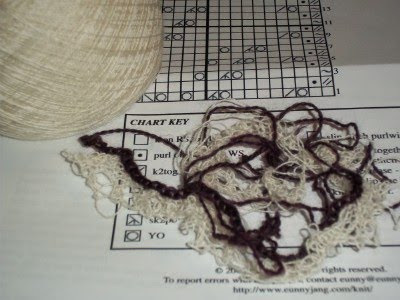 I am not an inexperienced lace knitter. I know the tricks. I know the pitfalls. 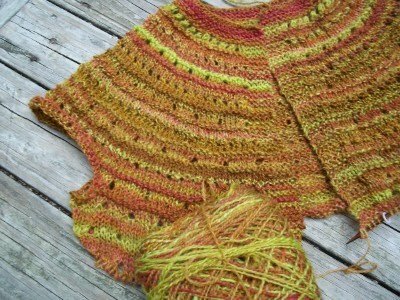 A while back, I spent a small fortune ($30) on a lovely ball of gossamer weight yarn and attempted to cast on a small shawl using what I would consider an easy pattern. 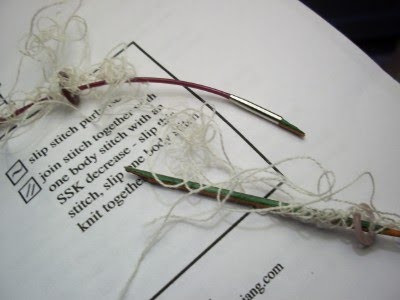 After the third attempt at getting to row 2, my temper got the best of me and with a not so gentle yank of the offending yarn to frog it, managed to snap my size 1 Harmony needle in half. Poor thing. It was the nasty old yarn I was trying to break-not the needles. You have to be out of your mind to knit with stuff as skinny as this. It defies being told what to do by yarn markers. 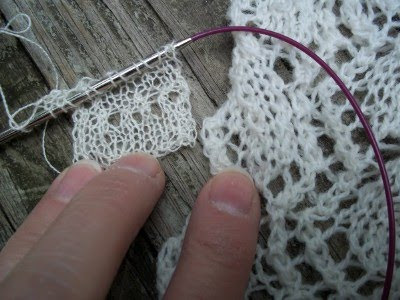 It makes stitches that you knit and purl together disappear. You can't even get a good stitch count when yarnovers are involved. AND you CAN'T tink back. This is the biggest yarn fit I have thrown in quite a while. I'm going to put it in timeout for a while and worry about it later.